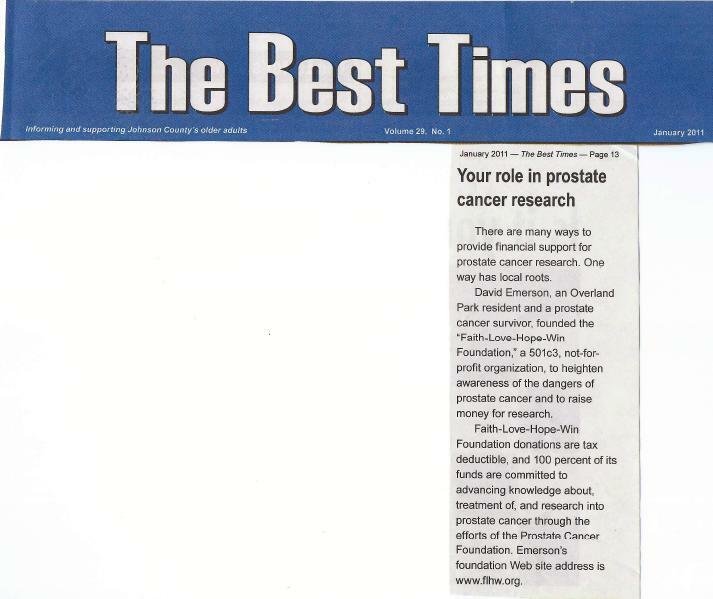 The following article appeared in the August 2014 edition of “The Best Times”, a senior living publication distributed in Johnson County Kansas. Disc-tractions, by David Emerson, a Disc Golf World 20th Anniversary Writing & Photo Contest Winner. "Cancer fighter builds a winning foundation"
The following article appeared March 25, 2007 in the Kansas City Star. On January 13th David had quite an exchange with a call into Dennis Miller. David Emerson speaks on Kansas City Live on August 10, 2006. David shares his battle with Prostate Cancer, the need for men over 40 to be tested and the foundation’s upcoming golf tournament. 38 The Spot’s Jack Harry interviews David Emerson together with David’s Urologist, Dr. Brad Davis, to raise awareness about Prostate Cancer and the need for men over 40 to be tested.